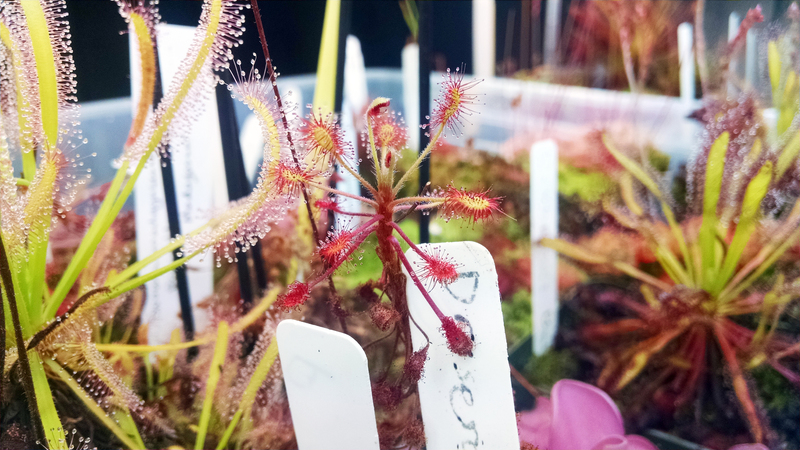 Donate to assess carnivorous plants, get free gemmae |Sundews Etc. Happy holidays everyone! I hope everything is going well with you, your family, and especially your plants. I've got a chance for you to add something new to your collection, and do a good deed for the season at the same time! Look at that fly man. Makes me want to donate some money. 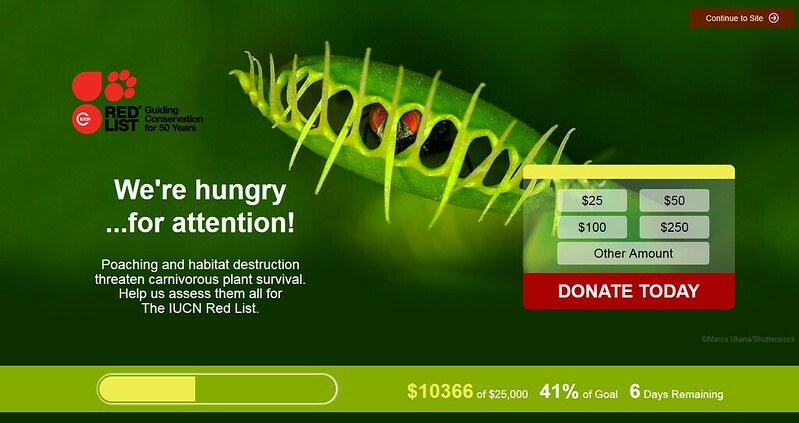 The IUCN Red List is trying to assess the vulnerability of all carnivorous plant species. Naturally this is a huge effort, and the first step is this fundraiser – $25,000 to hold an initial 5-day workshop to create a baseline assessment for many species, and then subsequent goals to do field assessments across the world. This fundraiser has been active for a couple months and is only at 41%. HOWEVER, very often these fundraisers get a huge portion of their funding right at the end. So let's make it happen! Earlier today I donated $25 to the effort. This is after having seen the appeals over and over. I now want to offer an additional incentive to you all to donate. If you donate $10 or more to this fund drive, I'll send you a free pack of pygmy sundew gemmae! Just email me a screenshot of your thank you screen (or message Sundews Etc. on Facebook) and I'll let you know what I have available! U.S. shipping only, alas. These Drosera sargentii have recently gone absolutely nuts with gemmae. There are lots of threats to carnivorous plants around the world. Pygmy sundews often have a very small native range, and many species could potentially be wiped out by development projects. Which ones are at highest risk? We don't know! Hopefully this assessment will help us find out. 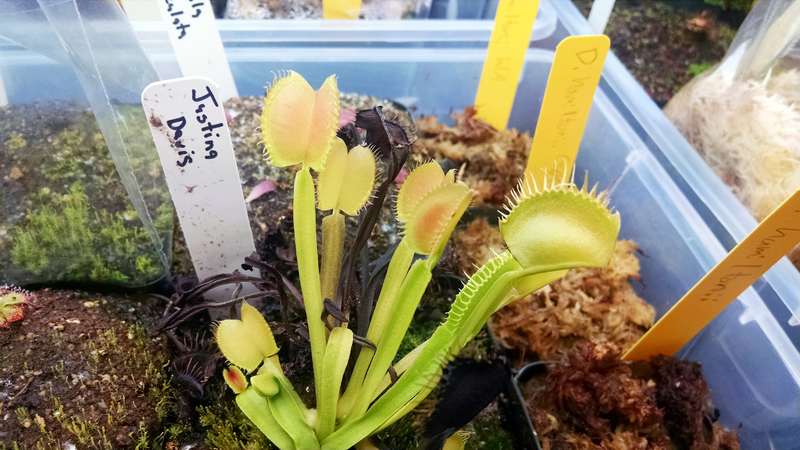 Dionaea muscipula 'Justina Davis' is a rare cultivar, but that's another issue entirely. The iconic Venus flytrap is one of the most mass-produced carnivorous plants in the world, and yet is under extreme pressure from poaching. North Carolina has recently cracked down on the wild collection of flytraps, but they're still under threat. Are there other places where better enforcement or more robust laws could help protect plants? Probably! Maybe this list can help us identify them. These plants need your help! And a repotting. 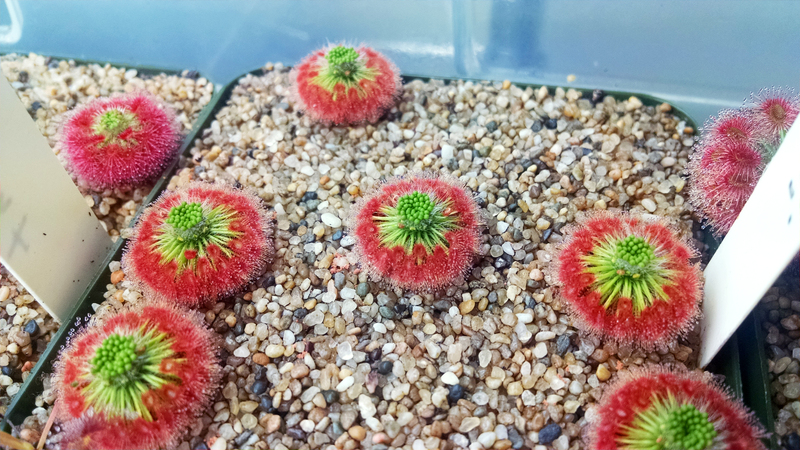 Did you know that Drosera madagascariensis is extensively wild-collected in Madagascar for export? Most of the collection is done by local people to supply the natural medicine and cosmetics trade. Could there be ways to work with local people to build sustainable industries around their carnivorous plants? Sure! But we need to identify the problems before we can start working on the solutions. I love pygmy sundews. I want everyone to grow them. I also want to be able to visit some of my favorite carnivorous plant species in the wild, to appreciate them in their unique habitats, and to gain insight by seeing their place in the broader ecological picture. Please donate in the next week so that we can take the first step to protecting these astonishing plants. If all you can spare is a couple bucks it will make a difference. And I've got all these gemmae sitting around after all! Announcing the ICPS Holiday Seed Drive!